*Please note that the links to the content in this Part will direct you to Westlaw AU. If you are still using Legal Online, the links can be found in the LOLA PDF at the bottom of this post. This article reflects on the extent to which the green bans have influenced the framework for public participation in planning in New South Wales. 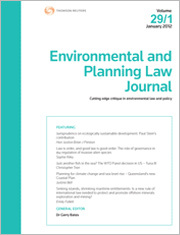 It critically examines claims that the Environmental Planning and Assessment Act 1979 (NSW) (EPAAct) was best practice at the time it was passed, thus challenging suggestions that current planning problems should be attributed to amendments made since its enactment. While the green bans were a catalyst for the introduction of the EPA Act, the relationship between the bans and the legislation is more complex than generally understood. This article argues that the EPA Act took very little from the green ban movement, and as a result embedded an adversarial approach to planning that remains at the heart of current problems in New South Wales. In 2009, changes were made to the Environment Protection Act 1993 (SA) that inserted Pt 10A into the Act to address site contamination. Although site contamination had been recognised in South Australia as a problem since the early 1980s, it took almost 30 years to achieve a comprehensive set of legislative controls in that State. While a number of the new controls reflect similar provisions in existing legislation elsewhere, one unique aspect relates to the provisions that deal with responsibility for site contamination. The starting point is that the person who caused site contamination should be held responsible for addressing that contamination. However, under s 103E, a vendor or transferor of land may seek to transfer liability for site contamination subject to meeting certain requirements. This article looks at those requirements, noting the conflict that has arisen on how they should be interpreted. The article is critical of the failure to initiate complementary changes to the land-use planning legislation in South Australia, without which it will be difficult to achieve the full effect and benefits of the site contamination controls. The NSW Office of Water recently introduced reforms to its policy for controlled activities on waterfront land, for the purpose of liberating housing supply. Minimum riparian corridor widths will now be based on stream order as determined by the 60-year-old Strahler method, and offsetting will allow for the encroachment of works within a corridor. Such changes are not predicated on scientific evidence and will likely compromise the environmental health of rivers and riparian systems. First, using stream order to determine riparian setbacks is misaligned with catchment-specific environmental priorities and will not provide certainty for stakeholders due to difficulties in determining the presence of a bona fide river. Secondly, enabling offsetting of works elsewhere along a riparian corridor risks undermining the efficacy of a riparian corridor’s functionality. Finally, the lack of public consultation and prioritising immediate economic gain over long-term environmental protection is contrary to best practice environmental management. Despite provisions in the National Water Initiative (NWI) to the effect that Indigenous Australians should have greater participation in water planning, they are still excluded from participating in management involving water governance and economic develop- ment. This article examines the success or otherwise of State legislation and policy and of native title claims in the overall context of fulfilling the goals of the NWI. It argues that the implementation of the NWI gives a low priority to Indigenous needs in over-allocated catchments, that its goals are prejudiced by delay and difficulties in native title determinations, that consultations with Indigenous peoples are either lacking or outdated, and that outcomes generally preclude economic development. It is argued that the adoption of co-management models, especially in northern Australia, where the Indigenous land estate is substantial, may better satisfy the goals of the NWI. The Planning and Environment Court of Queensland (PEC) has, since March 2007, provided an “inhouse” mediation service through the Alternative Dispute Resolution (ADR) Registrar. This article considers the views of the PEC’s participants in the mediation process in the PEC’s jurisdiction. In particular, it considers how the mediation process responds to theoretical and practical issues with mediation in planning and environment litigation. The analysis of these issues has been greatly assisted by the willingness of a judge of the PEC and the present and former ADR Registrars to be interviewed in relation to their experiences with mediation in the PEC. Australia’s kangaroo industry represents the largest commercial kill of land-based wildlife in the world. The environmental law and policy that governs the industry primarily seeks to facilitate the killing of kangaroos on the basis that they damage agriculture and provide a renewable natural resource. The need to conserve kangaroos acts as a limiting factor to temper the commercial interests of landholders and shooters. This article identifies a number of problems with the current regulatory framework, particularly the lack of adherence to the precautionary principle. It highlights key measures of reform that could be introduced to enhance the regulatory framework and conserve kangaroos, such as density trigger points. Finally, the article argues that, on the basis of current scientific knowledge and difficulties in adhering to the precautionary principle, there is a pressing need for Australian governments to reassess the reasons for and against management of kangaroo populations through commercial killing. For the pdf version of the table of contents, click here: LOLA – EPLJ Vol 30 Pt 2 Contents or here: WAU – EPLJ Vol 30 Pt 2 Contents.